If you crave a sophisticated, restaurant-quality meal without the sophisticated price tag then this might be just what you are looking for... only better, in the comfort of your own home! Oh yeah and in a fraction of the time! With Good Earth dry dinner kits all you have to do is just add meat. These dinner kits are perfect for those busy weeknights where time is not on your side. 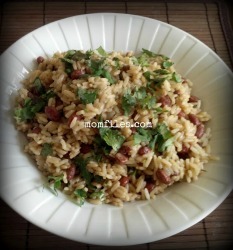 In less than 30 minutes you will have a complete meal without a lot of work. With 100% whole grain, no trans fat, no artificial flavors, no artificial preservatives, no MSG you can feel good about serving it to your family. 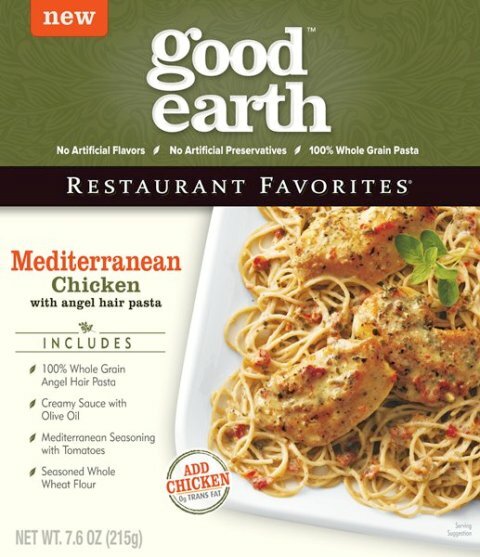 Good Earth dry dinner kits offer a selection of four tasty meals: Mediterranean Chicken with angel hair pasta, Spicy Citrus Glazed Shrimp with angel hair pasta, Herb Crusted Chicken with mushroom risotto and Tuscan Chicken with penne pasta. I received the Mediterranean Chicken with angel hair pasta variety to try along with a gift pack. 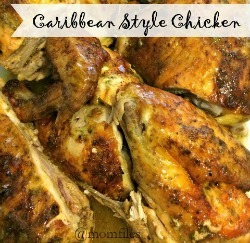 We cooked it last night and I have to say it is way better than I expected since I am not a big pre-packaged meal kind of cook. Since the husband was out of town he had the camera so I could not take photos. It was so easy to make and it took about 20 minutes. I made mine with chicken tenders so that I could cut out the step of having to slice up chicken breast. I think we will try the Herb Crusted Chicken with mushroom risotto next time. 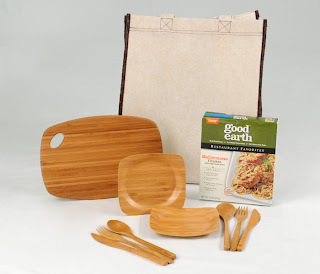 My Good Earth gift pack that included a Good Earth Mediterranean Chicken dry dinner kit, two sets of bamboo flatware, two bamboo dishes, a bamboo utility board and a 100% recyclable grocery tote. Now you have a chance to win the very same gift pack. --You can Twitter this giveaway (one per day) and leave me a link to your Tweet. *Be sure to have a visible email address in your comment if you do not have a Blogger profile. Giveaway is open to US residents 18+ only. Deadline to enter is June 22, 2010 at 09:00 pm EST. Good luck! 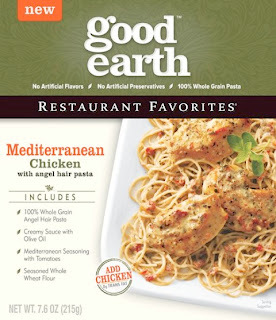 Disclosure: Good Earth provided me with the free product, information and gift pack through MyBlogSpark™. I would love to try the herb crusted chicken and mushroom risotto! YUM! The Herb Crusted Chicken with Mushroon Risotto. That served with cold beer. I'd love to try the Mediterranean Chicken! Thanks for the giveaway. My family would love the Spicy Citrus Glazed Shrimp with Angel Hair Pasta. I would love to try the Mediterranean Chicken with angel hair pasta. Thanks for the chance! I'd love to try the Herb Crusted Chicken with mushroom risotto. The Spicy Citrus Glazed Shrimp with angel hair pasta would be perfect for my husband & myself. The Tuscan Chicken with penne pasta also sounds great. I'd like to try the Herb Crusted Chicken with Mushroom Risotto :) *Thanks* for the giveaway! I'd like to try the Herb Crusted Chicken with Risotto. The Tuscan Chicken with penne pasta. I would like to try Spicy Citrus Glazed Shrimp with angel hair pasta! My first choice would be the Spicy Citrus Glazed Shrimp with angel hair pasta! Yum! I would love to try the herb crusted chicken with the mushroom risotto. Yum! I'd definitely go with the Tuscan Chicken with penne pasta. Thanks! I would like to try the Mediterranean Chicken with angel hair pasta. I would have said the herb crusted chicken, but I hate mushrooms and the risotto has mushrooms lol. Tuscan Chicken wth penne pasta would be delicious! I know it'd be a hit in my family. The Spicy Citrus Glazed Shrimp sounds great! I would love to try the Mediterranean Chicken with angel hair pasta! Great giveaway! I would love to try the Mediterranean Chicken with angel hair pasta. Herb Crusted Chicken with mushroom risotto sounds great, would love to try! I would love to try the Herb Crusted Chicken with mushroom risotto. The Herb Crusted Chicken with mushroom risotto sounds really tasty! Hungry now :) Thanks for the chance! Following momfiles on twitter (@amandapersists) Thanks! The Mediterranean Chicken with angel hair pasta sounds yummy, minus the chicken because I'm a vegetarian. But the pasta part sounds amazing. I tweeted about it again. It's up on facebook again. I'd like to try the Herb Crusted Chicken with mushroom risotto dinner. I would love to try the Tuscan Chicken with Penne!! I would like to try the Herb Crusted Chicken with mushroom risotto. I'd like to try the Tuscan Chicken with penne pasta. I would love to try the Tuscan Chicken with Penne Pasta. I would love to try the Tuscan Chicken flavor. Thanks! I would like to try the Tuscan chicken. Spicy Citrus Glazed Shrimp, yum! Would love to try the the Mediterranean Chicken with angel hair pasta. Thanks for this great giveaway! Herb Crusted Chicken With Mushroom Risotto and Tuscan Chicken With Penne Pasta would be my choices! I'm now following ya on Twitter (@KawaiiSplosion)! Tuscan Chicken with penne pasta, yum-o! mmm...would love to try the Mediterranean Chicken with angel hair pasta! sounds delish! Wow. tough choice as they all sound so good. I guess I'd have to go with the Tuscan chicken with penne pasta! I so want to try Spicy Citrus Glazed Shrimp with angel hair pasta. Thank you! Tuscan Chicken with penne pasta sounds great! Thanks for a chance! I would to try the Herb Crusted Chicken with mushroom risotto. I would love the Herb Crusted Chicken with mushroom risotto, thanks! I am vegetarian, but I am sure my boyfriend would love to try the Tuscan Chicken with penne pasta. Mediterranean Chicken with angel hair pasta. Thanks for the chance! I like the Mediterranean Chicken W/ Angel hair Pasta. I'll pick the Spicy Citrus Glazed Shrimp with angel hair pasta. Then I'll try the others. Thanks for the contest. I would like to try the Tuscan Chicken with penne pasta.